It was a cold, dark, rainy night in the historic district of Downtown Frederick. As the clouds parted, and moon slowly emerged from the darkness, all that could be heard was the rustling of the leaves in the trees - the wind, as it whipped around the houses. It wasn’t a good night to be outside, but the woman was determined to stick with her nightly routine, a brisk walk with her beloved dog. He wasn’t very big, but was very trustworthy, and would not hesitate to help if the need arose. 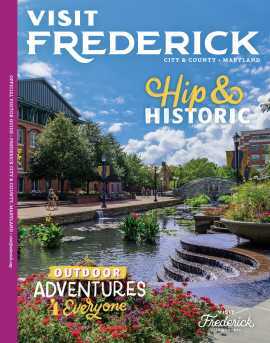 As she opened the front door of her house, a cold blast of Arctic air pelted her squarely in the face, she paused only briefly, then stepped outside and unknowingly began her journey into Frederick’s dark, tumultuous past. It wasn’t long before her dog stopped very abruptly and began to growl. She pulled at the dog’s leash - he stood steadfast and defiant. She wasn’t sure what was creating her dog’s bizarre behavior. But she soon realized the focus of her dog’s attention was not in front of her, but something lurking directly across the street, between two narrow brick buildings. Again she pulled at the dog’s leash, again he would not move. It was then she saw something that would make her vow, never, ever, again, to walk the darkened streets of Frederick alone. Out of the darkness emerged a man. A man dressed in black. He had a wide-brim hat, long billowing coat, knee-high boots. He limped as he crossed the street. She said he looked so odd, that a cold chill ran down her spine. It was then a vehicle drove by illuminating the area even more. And it was THEN she discovered the man was entirely black from head to toe – his eyes nothing but Black Empty Sockets! His clothes – tattered, torn and dirty. As if being drug out of a freshly dug grave! As the man stepped up onto the sidewalk, instead of making a left or a right, he continued with his ghostly march and walked straight through the brick wall directly in front him. At this point her dog was whimpering, his tail between his legs. Her legs were frozen in time, but within a few short moments, both her, and her dog were bolting to the safety of their home. The next morning, under the comforting light of day, the woman went back to the exact spot to see if she could find any clues as to what had transpired the night before. She had walked throughout downtown Frederick - both day and night - and never once saw anything out of the ordinary. But that morning she discovered something she had never noticed before, a now obvious historical marker. Where she had stood only a few hours before, in 1776, was the site of Frederick’s notorious Tory Jail. A jail specifically built for British Sympathizers - Traitors to the Colonies! This indeed was not a place you wanted to be sent to, because for a few unfortunate men, this would be their final destination before being executed for High Treason. In 1781, seven men from Frederick were convicted of High Treason. And three of those men were sentenced to be Hung, Drawn and Quartered - a very barbaric form of execution left over from the Middle Ages. The woman now believes the Apparition she saw the night before was somehow connected to Frederick’s notorious Tory Jail. Could it have been one of the Prisoners, the Constable, or maybe even the Dreaded Executioner? No one knows for sure. But if you happen to be walking through Frederick’s Historic District one cold, dark, rainy night, pay very close attention to anyone crossing the street. It may be someone crossing over from the world of the DEAD, back into the world of the LIVING, and it’s definitely an encounter you will not soon forget. 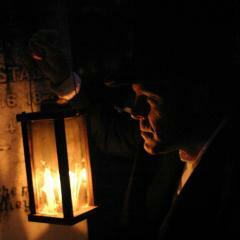 If you liked this spooky story about Frederick&apos;s past, you will really love Ghost Tours of Historic Frederick!